Do you remember that Channel 4 sitcom from the 90s about priests? There were four of them living in a flat in Northern Ireland and they were always saying "Game on, mate!". Oh what was it's name? One Foot in the Bishop? Reverends Behaving Badly? Archdeacon Sweetheart? We're being silly, honking geese, of course, as we all know it was Father Ted and was written by the mercurial partnership of Graham Linehan and Arthur Matthews. It was the sitcom that propelled them into the big league, but just six months prior to the airing of Father Ted, their debut sitcom Paris had sunk without trace. Paris starred Alexi Sayle as Alain Degout - a struggling, talentless artist living the dream in 1920s Paris. Degout strove to be regarded as a reputable artist, but this credible facade would soon crumble once money was mentioned. He was, in some respects, a prototype for the hypocrisy of Father Ted Crilly. Surrounded by idiots such as Rochet (Neil Morrissey) and Beluniare (James Dreyfus), Paris took satirical sideswipes at the era's rapidly changing views on arts and politics. Linehan and Matthews had been honing their trade on sketch shows for several years such as Alas Smith and Jones, and The All New Alexei Sayle Show. The time had come to make the move from three minute sketches to full on sitcom episodes, so in 1994 they made a break for it. Channel 4 were delighted, as ever, to get their hands on something based in the arts and duly commissioned a series; It was transmitted on Friday evenings between October to November 1994. Even before Paris was first aired, Linehan felt that "We knew that it was going to get badly reviewed. We had this little tiny bit of hope in us – ‘Maybe we were wrong, maybe it’s good, maybe it’s just us"(1). 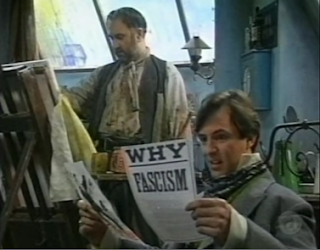 Matthews was also concerned that it was going up against the colossus that was Harry Enfield and Chums (2), a show that they would also write for. Their fears were realised when the show came in for scathing reviews from the critics and the public alike. There was no repeat airing and the show has never been released - not even on Channel 4's On Demand service which houses literally everything else. For those desperate to watch the series, we recommend searching through Google to find copies being sold at "Rare TV" type sites. 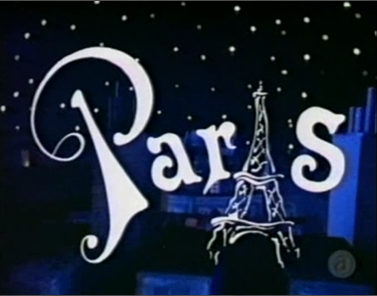 Curious British Telly approached Paris with some trepidation. The works that Linehan/Matthews are most famous for are Father Ted and Big Train. What with these being the very pinnacle of British comedy, we didn't want to sully this view. Our mind also turned to our childhood trips to Paris and that neverending hike up to Montmarte for a fantastic view of the lovers city and the impromptu trip – guided by school teachers – through Paris’ red light district. Could Paris really match up to that Paris? There’s certainly a lot of laughs in Paris with trademark Linehan/Matthews dialogue such as Eleanor Bron as a court judge remarking “Attempting to kill a judge in court? I’m no expert on the law, but I don’t think that’s allowed.”. Moving nerdishly aside for a moment, we must also point out a nice bit of Eleanor Bron trivia. Not only did she appear as a guest star in Paris in Paris, she also guest starred in the 1979 Doctor Who serial City of Death which was, as you should have guessed by now, set in Paris. Moving back to a less tangential position, Linehan/Matthews also showcase their adept skill with surreal and cartoonish flourishes such as the violent and bizarre relationship between music teacher Minotti (Allan Corduner) and his pupil Madame Ovary (Beverley Klein). The casting director has - Alexei Sayle aside - gone for a number of newcomers who add a verve to the series. A number of them such as Patrick Marber, Rebecca Front and David Schneider were from the Armando Iannucci/Chris Morris stable. This particular collective had, earlier in the year, landed on BBC2 with The Day Today and were helping to usher in a new era of British comedy. Neil Morrissey plays the part of an impressionable fop with some élan and against the the laddish roles he would become typecast with. 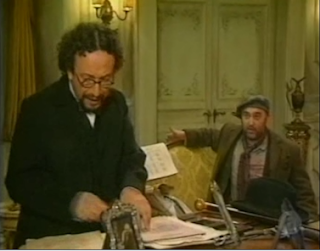 Allan Corduner also puts in a rich performance by bringing to life the wise and eccentric aspects of Minotti - he is also one of the few performers to adopt an accent in the series. Alexie Sayle is, however, the weak link. He’s just too shouty and gurny. This was fine for The Young Ones where he had only fleeting appearances, but here it begins to grate especially against the other more assured performances. The plots are perhaps one of the weaker elements of the series. They aren’t terrible by any stretch of the imagination, but they never really sprout wings and soar. We put this down to the isolation of the characters. Degout, Rochet and Beluniare are kept apart for the majority of the stories, but we feel trapping these three together would have created greater conflict and thus more driving plots. As it is, Degout usually has a little adventure and Rochet pops up here and there before Beluniare gets some egg on his face at the end. Overall though, Paris very nearly matches up to our childhood memories of Paris, but with less prostitutes obviously. The comedy alone makes it worthy of watching a few episodes and if you’re a fan of Linehan and Matthews brand of humour, you’ll enjoy the whole series. It’s a shame that no second series followed as there was potential to iron out the creases, but the Father Ted phenomena had started gathering pace and Channel 4 obviously wanted to concentrate on this. Manic comedian Alexei Sayle turns up in an unlikely new setting tonight. Hard as it is to picture the loud-mouthed Liverpudlian in the bohemian café society of Paris in the 1920s, that’s just where you will find him, in a new six-part comedy series directed by Drop The Dead Donkey’s Liddy Oldroyd. Sayle plays Alain Degout, a larger than life painter convinced that success is just around the corner. 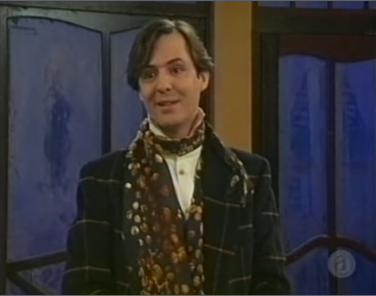 More often than not, he is to be found at the Café Hugo, where his acquaintances include a dandified painter (Neil Morrissey), a suicidal poet (Liz Kettle) and a passionate, nay hysterical , Italian singing teacher (Allan Corduner). Written by Graham Linehan and Arthur Mathews, the duo behind last year’s Smith and Jones and The All New Alexei Sayle Show, Paris also features guest stars including Eleanor Bron, John Bird and Windsor Davies. Half-decent series but it doesn't come remotely near to the Blackadder 'man trapped out of his time' vibe it so obviously apes (or should that be 'apres'?) And yes, it is surprising that Morrissey and Dreyfus barely meet when their characters are tailor made for comic antagonism. 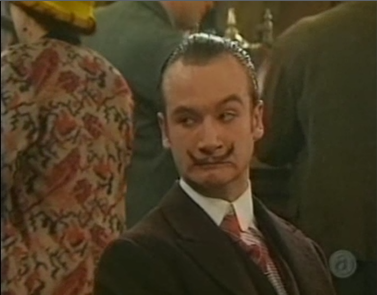 Incidentally, the writers' interest in the interwar period art scene also emerges in the 'Kicking Bishop Brennan Up the Arse' episode of 'Ted', which was inspired by the strange and cruel pranks Salvador Dali used to play on people.